In an effort to catch up on stuff I painted in 2018, here's a second post in a row of 'stuff I painted some time ago'. Some time ago for these is somewhere around about July, when I ran game featuring Venators at Bring Out Your Lead 2018. The game involved all participants bringing or using a bounty hunter, and I painted up this quartet in case someone didn't have a suitable figure to use. The 4 Venators pictured comprise two of the original Confrontation figures, an old chaos familiar, and a converted Venator armed with a shotgun. 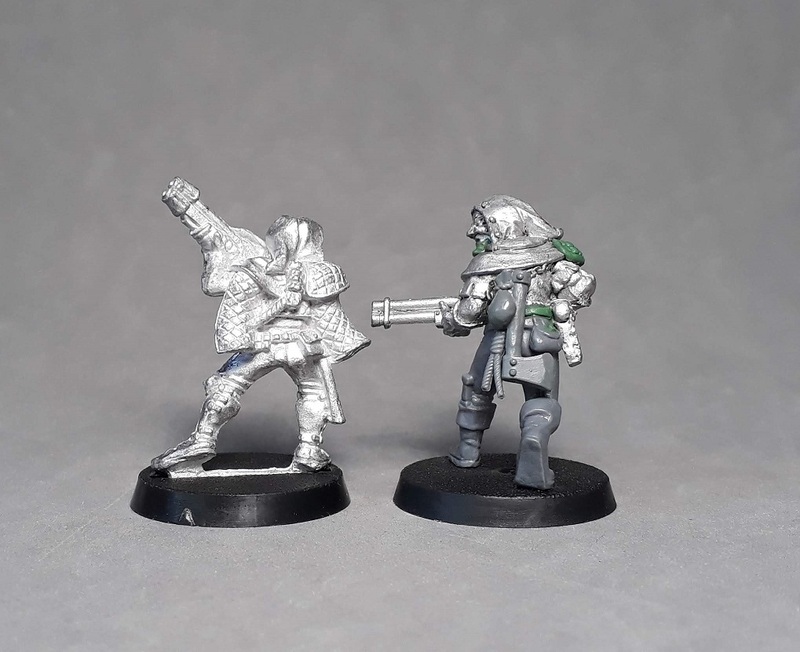 The two figures below are Marauder Confrontation figures - masked and hooded, complete with nooses and equipped with a variety of weaponry, they're great sculpts. I painted them to mirror the colour scheme on my modern plastic Venators, so I can intermingle them if required. I'm a big fan of adding creatures and familiars into a warband, and the 'Jester' chaos familiar is a perfect fit for a Venator band, with his grotesque mask and little hood. The Venator with the shotgun was converted from the upper torso of an old Necromunda Redemptionist, with some plastic Warhammer Empire legs. To complete the Venator look, I added some kneepads, a quilted shoulder pad, a Venator badge (mirroring the guy with the bolt pistol), and some plastic accessories. I think he fits in nicely. I've still got the remaining two Confrontation Venators to paint up at some point. I'll get round to it one day! These are magic. Outstanding conversion on that shotgun ganger. It looks seamless even without paint. The familiar is perfect for a venator gang. Thanks very much! It was a bit of a faff to cut that Redemptionist in half and get rid of the robes, but I think the result was worth it. Super rad. Love the venators project. Venators are one of the coolest concepts in a very cool setting! Glad you like these guys. Converting up troops to blend in with such an obscure range means I didn't notice at all this was a conversion. Thanks for the pre-painted photos to explain how they were done! Really inspired use of the old Chaos Familiar. I seem to spend much of my time converting figures to blend with obscure ranges - after all, there's pretty much only 4 figures for each Confrontation faction, and using duplicates isn't really my thing! That Familiar is a cracking little addition to the band! He fits in nicely doesn't he? Those are great! The conversion of the guy with the shotgun is perfect. I have that shotgun redemptionist on my work bench at the moment (he's been there for a whole lot of moments now), and I really appreciate how you have made such a flat figure more 3d. Glad you like them! Funnily enough, flat figures is so ingrained in my psyche, I struggle with more dynamic figures!! Love these conversion, ace work! What a lovely bunch. I love the shotgun Redemtionist conversion, you've really given him a lot more dynamism and life with the new pose. I really like the fact that he now looks like he's cautiously looking round a corner. Funny how something as simple as changing the legs completely changes the look. Very nicely done. Great stuff! Awesomeness! Love the subdued paint scheme, they look fantastic! Hopefully the colour scheme enhances their level of sinisterness (is that a word?!). I think a certain Mr Grove might have used one of my Venators…! 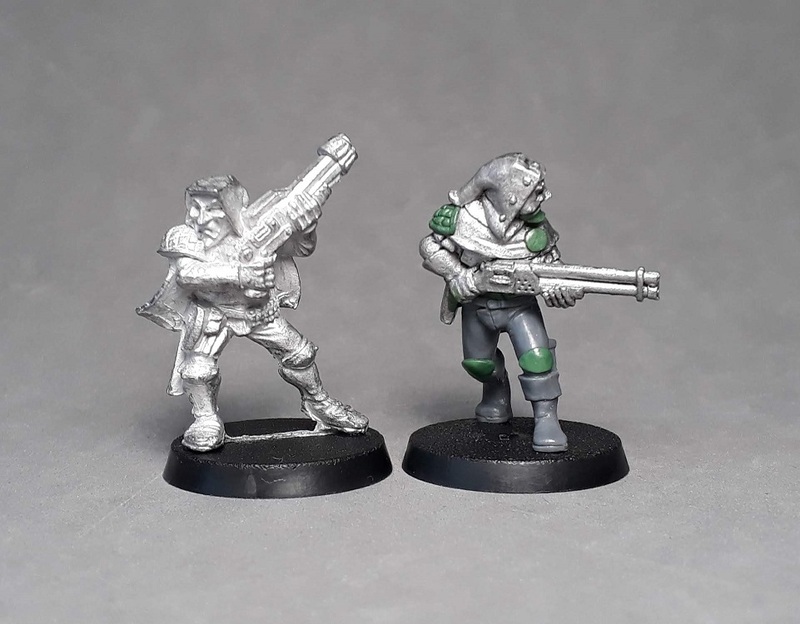 I've been making use of similar parts from the Empire Militia sprues to create a gang based on the Confrontation Elite minis (the ones with the bandanas and padded doublets), so the Venator with the similar legs is very inspiring to see here. Those militia parts will be perfect for the Elite gangers I think. 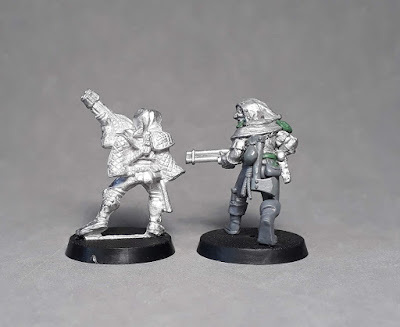 I was looking at some of the other Empire metals for the same job - some of them like the cannon crew are understated enough to be adapted (unlike the rather more flamboyant puff and slash types). These are fabulous Axiom, and the shotgunner is sublime. Do you have any photos of them with the converted Venators that made it on to Warhammer TV? Thanks cheetor! I haven't set up a group shot yet, but I will. The only jarring element is the Necromunda basing on the plastic guys. I may go back and add some grey hive dirt to them to blend the basing a little.